In 1968 Larry and Jeanne Ambruster started a dairy farm with a herd of 30 cows, and they called it ‘Creamy Acres’. Much has happened since then: the family grew to include 4 children, and the herd grew to 100 cows. 1985 saw the addition of the flower business that today includes 20 greenhouses serving both retail and wholesale customers with annuals, perennials, herbs, hanging baskets, potted containers and garden gift items. The Ambruster’s youngest son, Ron, and his wife Kim, joined the business in 1987. Ron introduced agri-tainment to the farm in 1995. The new entertainment business, Night of Terror, LLC, includes haunted houses, haunted wagon rides and haunted cornfield maze. The Night of Terror, LLC is the thrill of October for older children and the ‘young at heart’ adults. Spring of 1996 bloomed with “Fun on the Farm” activities for the entire family. “Fun on the Farm” includes the barnyard pals, a play area, wagon rides and pumpkin patches. In 1997, Creamy Acres was looking to expand the business in a compatible way with the greenhouses. Creamy Acres began to offer landscaping services. Creamy Acres Landscaping now serves it’s customers with lawn mowing, maintenance, clean-ups and mulching. 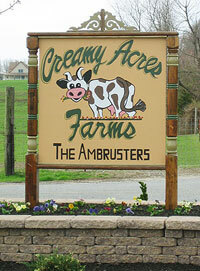 Additionally, in 2003 Creamy Acres Farm decided to do educational dairy tours. The dairy tours provide an opportunity for children and adults to get a first hand look at a real working dairy farm. As most of you know Jeanne passed away in November of 2006 with Ovarian Cancer. She is dearly missed, her daughters Leslie & Stacey along with many other family members and close friends continue to work at the farm to keep her spirit alive. Jeanne touched so many lives while sharing her love for herbs, her passion for the unique and unusual flower containers along with sweet and clever ideas she would bring to life for her customers flower beds. Each of us here at the farm have a little bit of Jeanne in our hearts and we bring it to the business. She was an amazing women who had a vision- a dream to always provide a warm inviting family oriented business where customers and their families can come and browse, sit a spell , enjoy the sights and sounds and take home that special and unique treasure that seemed to be created just for them. We at Creamy Acres do our very best to continue with her vision and dream. Come out and see us today! To glorify God by being faithful stewards of all that is entrusted to us. To have a positive influence on all who come in contact with us. The Ambruster family is very thankful and grateful to all of our customers who have come to Creamy Acres Farm these past 50 years. God Bless Everyone!